Day 10: May 7, 2015. 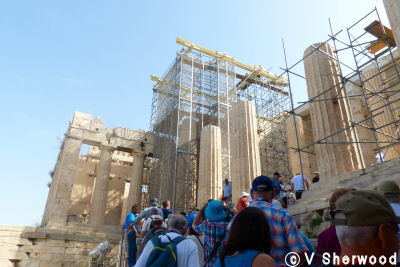 We were up early today to get the bus at 8:30 am into Athens to beat the queues into the Acropolis. We got there at 9:30 am but there was already a long line-up and it was hot. The temperature got up to 31°C. There was little shade and everywhere gleaming white marble reflecting the sunlight. The climb up to the acropolis was steep and difficult as the marble path was uneven and hiking poles were useless on the rock. However, it was worth the effort; the Acropolis is marvelous, despite all the scaffolding, cranes and people taking selfies. 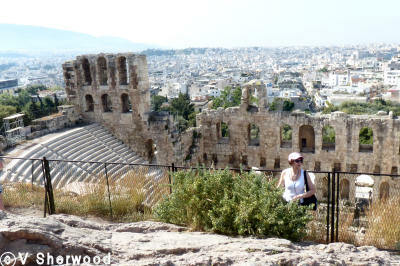 We had an hour and a half to look around and take photos, then walked to the Acropolis Museum. It is very well done. All the remaining sculptures from the Acropolis are there, safe from the effects of weather and air pollution - except the Elgin marbles of course which are in the British Museum in London, England..
A reconstruction of the Acropolis. 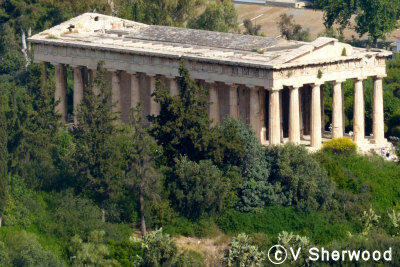 TheTemple of Hephaestus, below the Acropolis. The Theatre or Odeon of Herod Atticus. It probably had a roof, so it was an odeon. 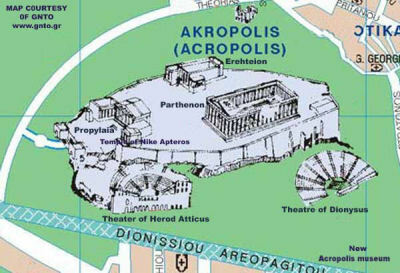 It is also below the Acropolis. The Propylaea, the entrance into the Acropolis. The crowd is following the ceremonial road into the Acropolis, which the citizens of Athens would have followed on feast days of the goddess Athena, the patron of Athens. The road is a ramp as sacrificial animals were also led up this way and it would have been bad luck if they had stumbled or fought against going up into the precinct. The Temple of Athena Nike, the victorious Athena, was completed about 420 BC to celebrate the Peace of Nicias which ended the first phase of the Peloponesian War. It was torn down in 1686 AD by the Ottomans and the stones used for defenses. It was rebuilt in 1834 AD, after Greece had won its independence from the Ottomans. Each of the 8 columns is one stone. 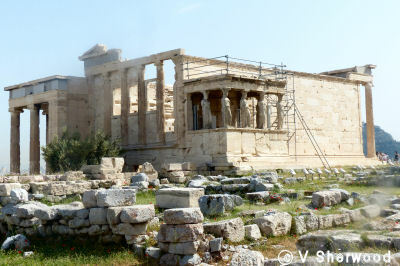 The Erechtheion on the north side of the Acropolis was dedicated to Athena and Poseidon. 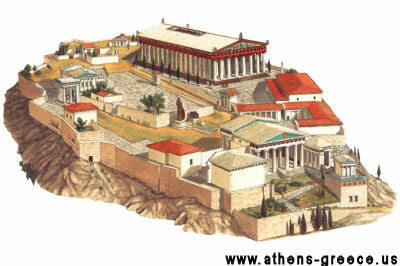 The architect was Phidias who also built the Parthenon. 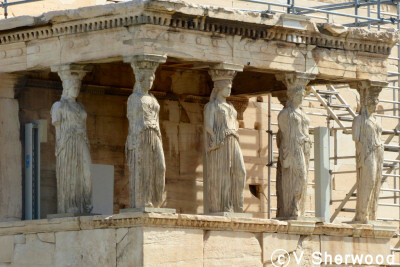 On the south side of the building is the famous Porch of the Caryatids, 6 statues of maidens which hold up the roof. The Erechtheion housed some of the most holy relics of the goddess Athena: the wooden statue of Athena Polias, Protectoress of Athens. The statue was believed to have been given to Athens by the gods and not to be man-made. The Erechtheion was built on the spot where Athena and Poseidon fought for the control of the city of Athens. A salt-water well marked where Poseidon struck the rock with his trident and an olive tree grew where Athene struck the rock with her spear and won the contest. The Portico of the Caryatids. These are all copies. 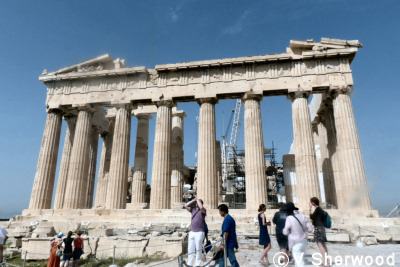 Five of the original statues are in the Acropolis Museum and the sixth is in the British Museum. The Parthenon was built between 447 and 438 BC on the site of an older temple to Athena which was destroyed by the Persians in 480 BC. The temple is aligned to the star cluster, the Hyades, and housed a gold and ivory statue of the goddess. In 1687, ammunition which the Ottomans had stored in the Parthenon were blown up by a Venetian bombardment and the building was severly damaged. In 1800 to 1803, the Earl of Elgin removed some of the remaining sculptures with permission from the Ottoman commander and took them to London. They are now in the British Museum. 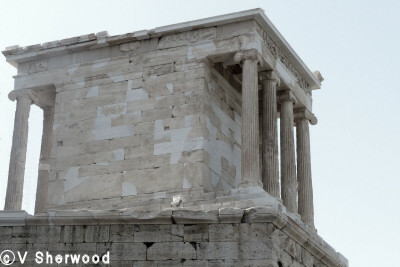 A copy of the eastern corner of the Parthenon friese. The horse is pulling Apollo's sun chariot which is rising in the east. The original is in the British Museum. 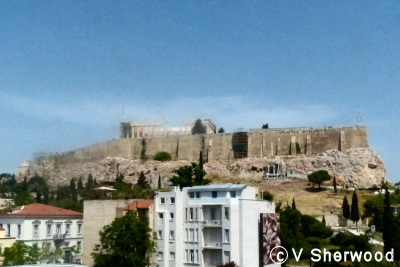 The Acropolis as seen from the New Acropolis Museum which houses all the remaining sculptures from the Acropolis to protect them from the Athenian air pollution and acid rain. 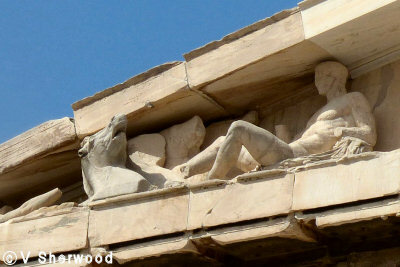 Part of the eastern pediment of the Parthenon, depicting the birth of Athena. 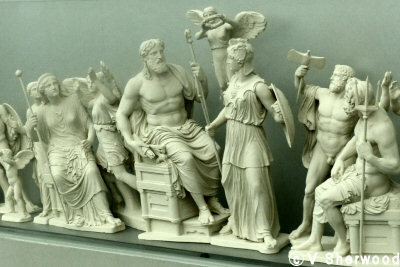 According to the legend, the chief god Zeus (sitting 4th from the right) had a headache. He told the god Hephaestus, god of the forge (second from the right), to hit him on the head with his hammer. Zeus's head cracked open and out jumped fully grown Athena (between Zeus and Hephaestus) with helmet, spear and shield. No wonder he had a headache. Part of the western pediment of the Parthenon, depicting the contest between Athena and Poseidon for the patronage of the city of Athens. Poseidon is holding his trident, ready to strike the rock and produce his gift to the city, a saltwater sea. Athena is holding her gift, an olive tree, which won her the contest. The city was named after her and she became its patron goddess.. The Parthenon pediments. The west pediment, the contest between Athena and Poseidon to be the patron of Athens, is above and the east pediment, the birth of Athena, below.